Prevent Frozen Pipes - Clear Pipe, Inc. 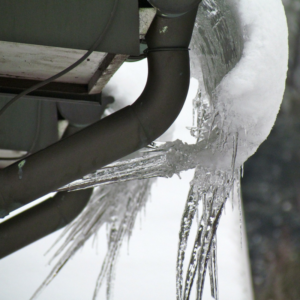 When water in a pipe freezes, it increases pressure in the entire plumbing system which can cause the pipe to break. 1. Insulate pipes. Make sure there aren’t any gaps between any of the pipes and the insulation. The more insulated the pipes are, the better protected they will be. Keep an eye out for pipes that have been frozen before or those that are exposed to unheated areas of the house (i.e., attic, garage, or crawlspace, etc). 2. Keep pipes warm. Wrap pipes in heat tape or thermostatically controlled heat cables. Always read safety information and instructions before doing it yourself. 3. Seal. Even a small opening can let frozen air in and cause a pipe to freeze. Seal up any leaks or cracks with caulk or insulation. 4. Winterize pipes. Disconnect garden hoses and turn outside faucets and spigots off. Failure to do this can cause frozen water from the hose to back up into the spigot until it reaches your pipes. 5. Have a backup. Add a battery backup to the sump pump so it can pump water out in the event of a power outage. 6. Call an expert. If you are unsure if your pipes are prepared for freezing temperatures, call an expert who can go to your house and make sure your pipes are protected. If you want to be extra cautious, you can ask them to empty out the drains and traps and replace it with non-toxic antifreeze. Keep the thermostat on above 60 °F at all times. This will keep the temperature at well above freezing water and allow for enough warm air to circulate behind walls and the attic. Allow warm water from the faucet to drip slightly as it will relieve the system’s pressure. Often, what causes pipes to burst is the pressure from the blockage of a frozen pipe and the faucet. Letting the faucet drip will ease the pressure and prevent the pipe from bursting. You waste more water with a leaking or burst pipe than you do from allowing the faucet to drip. Open interior and cabinet doors to allow warm air from the rest of the house to get in and circulate around the pipes. Avoid using electrical appliances in standing water as you can be electrocuted. Don’t try to thaw a pipe with an open flame/torch. It can burn down the house. Turn off the water at the main shut off valve in the house.